England surrendered their series to South Africa after being brushed aside in a bad-tempered second Test at Free State Stadium that registers their sixth successive defeat. A blistering start that saw Mike Brown and Jonny May run in fine tries to open up a 12-0 lead evoked memories of Ellis Park a week ago but, although the collapse that followed was not as dramatic, it was ultimately more convincing as they failed to score again. Duane Vermeulen, a Springboks force at number eight, stormed over before the home scrum won a penalty try that placed Eddie Jones' men on the brink in the Afrikaners' heartland of Bloemfontein. Once again the boot of Handre Pollard helped sweep South Africa out of reach as three penalties made their mark on the scoreboard, propelling the hosts to a 2-0 series victory with one Test still to play in Cape Town. The ambition of becoming the first England team to complete a triumphant tour on these shores is in tatters, leaving Jones under growing pressure while the Springboks celebrated victory and another important landmark - Tendai 'Beast' Mtawarira becoming their first black player to make 100 Test appearances. Added to Jones' problems was the injury sustained to Billy Vunipola shortly before half-time after the big number eight limped off - which places his involvement in the climax to the series in grave doubt. 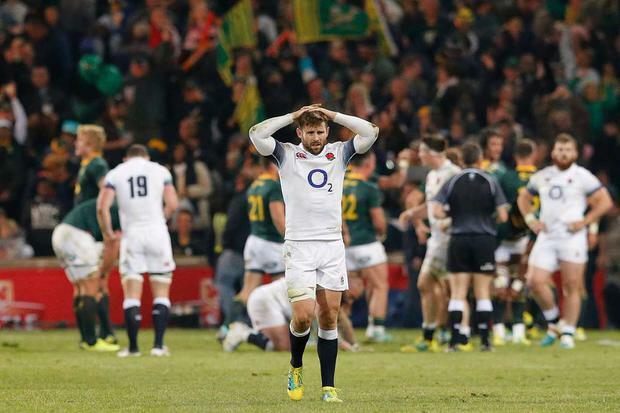 Images of the mesmerising opening in Johannesburg came flooding back as England surged into a 12-0 lead once an ankle tap by Owen Farrell had stopped Damian de Allende scoring an intercept try. Billy Vunipola's bulldozing run through the middle produced the initial momentum and - with green shirts sucked in - they went wide to exploit an overlap with May drawing Willie le Roux before feeding Brown the scoring pass. Space continued to open up out wide and England shipped it there as quickly as possible, a juggle by Brown releasing Elliot Daly before May sprinted over the whitewash. South Africa fought back with a 15-metre rolling maul that began a period of home dominance interrupted by a series of mini brawls and ended when Mtawarira burst through the middle and Vermeulen ran over a tackle by Maro Itoje to score. Itoje and Vermeulen locked horns but it was Mako Vunipola's slapping of Pieter-Steph du Toit's head into the ground that incurred the wrath of referee Romain Poite, although the Springboks failed to clear their lines with the penalty. A pivotal spell unfolded as half-time drew close, Pollard landing two penalties to nudge South Africa 13-12 ahead just as Billy Vunipola departed having allowed Bongi Mbonambi to escape. Nathan Hughes appeared at number eight for the second half but it was a baptism of fire for the Wasp as England came under fierce pressure as the Springboks initially attacked out wide and then down the middle. A five-metre scrum provided the breakthrough as the Red Rose pack was driven backwards before splintering, compelling Poite to award a penalty try under the posts. England's response looked promising only for the ball to get dislodged close to the line as Brad Shields sought to end a driving maul and, when they began to attack with intent, they were hamstrung by their error count. Pollard hit the mark again before Hughes' yellow card made another dent on the visitors victory hopes as the Springboks cruised over the finishing line.